'American Idol' judges decide Season 17's Top 20 singers -- including Laine Hardy, Alyssa Raghu and Evelyn Cormier! American Idol featured 40 hopefuls becoming the Top 20 contestants in "Final Judgment" following the "Final Showcase" round of performances during Sunday night's two-hour episode on ABC. 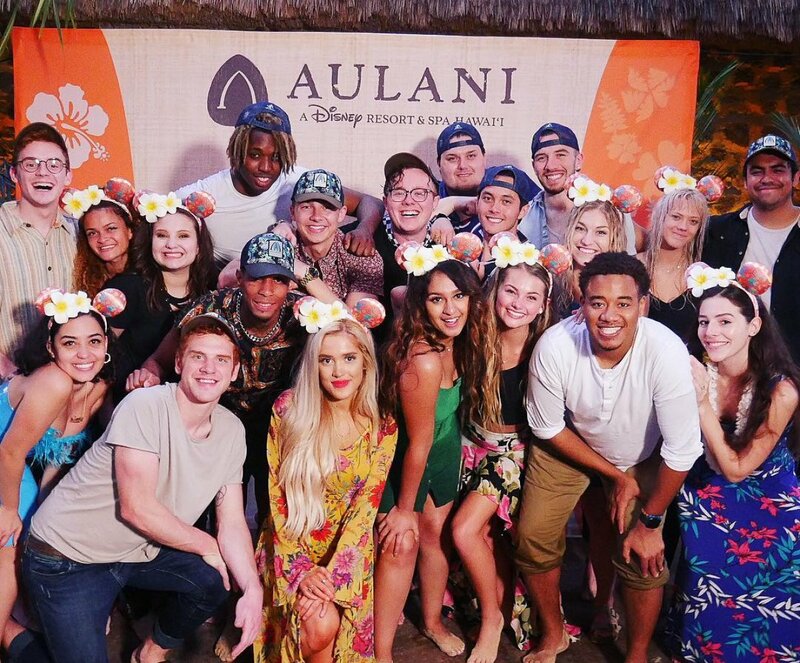 For the Final Showcase round, the hopefuls had to impress judges Katy Perry, Lionel Richie and Luke Bryan with their style, flare, choreography, and all-important song choice on the stage at Disney's Aulani resort in Hawaii. For her showcase performance, returning hopeful Alyssa Raghu, a 16-year-old high school student from Orlando, FL, performed "Dear Future Husband" by Meghan Trainor. Katy said her dancing looked "natural" and it looked like she had taken some dance lessons to perfect her onstage presence. Katy delivered the news to Alyssa in Final Judgement that she had made the Top 20. Madison Vandenburg, a 17-year-old high school student from Cohoes, NY, sang "Who's Lovin' You" by The Jackson 5, and she advanced to the next round. Katy called Madison "a star." Myra Tran, a 19-year-old high school student from Federal Way, WA, performed "How Far I'll Go" for her showcase performance. Lionel told Myra her voice, talent and potential is amazing but her performance from the previous night was not 100 percent. Lionel told Myra she didn't make the Top 20 but she shouldn't let this disappointment deter her from pursuing this as a career. Logan Johnson, a 20-year-old golf shop attendant from Boise, ID, sang "Sorry" by Justin Bieber for the showcase round and sang in two languages. Katy was pleased and compared him to a Jonas brother, and then Lionel noted he liked how he sounded and looked. Luke told Logan he made it into the Top 20. Nate Walker, an 18-year-old singer from Pittsburgh, PA, was on the tail end of being sick but he managed to belt out "Still" by Commodores. Lionel told Nate he possesses all of the "abilities" to be a performer but he's often in his head while singing. Lionel admitted the crowd wasn't feeling him enough. Dimitrius Graham, a 27-year-old retail associate from Baltimore, MD, sang "Latch" by Disclosure featuring Sam Smith and was then told he did, in fact, survive the Top 20. Ashley Hess, a 27-year-old dental hygienist from Fremont, CA, performed "Gone Away" by H.E.R. Although the judges would have preferred Ashley sing the song on piano, she still advanced to the next round. Luke mentioned they initially envisioned Ashley making the Top 10 and that was still possible. Drake McCain, a 17-year-old high school student from Spring City, TN, took the stage with "Girls Like You" by Maroon 5 but it sounded like he was losing his voice at parts. Katy liked Drake's interaction with the audience but could tell he was straining to hit some of the notes at times. Drake was therefore eliminated from the competition. Kai the singer, a 19-year-old factory worker from Kingstree, SC, performed "Wild Things" by Alessia Cara for her showcase performance. Katy noted she sang a couple of runs that weren't great, but Lionel could tell she felt everything she was doing on the stage. Kai unfortunately didn't make the Top 20, but Katy told her to continue gaining experience. Luke explained there was a part of every song Kai sang that she "didn't nail." Laci Kaye Booth, a 23-year-old college student from Livingston, TX, sang "Georgia On My Mind" by Ray Charles on guitar. "She is the definition of a diamond in the rough," Katy could be heard saying following Laci's performance. Katy said the timing was right for Laci and so she'd be going through to the next round because she's "really special." Nick Townsend, a 26-year-old production assistant from Tekamah, NE, was then shown belting out "Hold Back the River" by James Bay for his showcase. Luke said the judges had been honored to get to know Nick and his resilience but the showcase performance was not his biggest or best. Since everyone needs to be at the top of their game in the Top 20, Luke admitted Nick's time on American Idol was over. More cuts were then shown for fan-favorites Clay Page, a 24-year-old singer and songwriter from Elberton, GA; Kason Lester, a 29-year-old strawberry farmer from Lebanon, TN; and Johanna Jones, a 23-year-old fast food burger chef from Las Vegas, NV. Walker Burroughs, a 20-year-old college student and resident assistant from Birmingham, AL, belted out "Youngblood" by 5 Seconds of Summer on the piano for his showcase performance. Lionel said the judges had enjoyed watching him grow and so it would hard for them not to see him in the Top 20. There was good news, however, for Ryan Hammond, a 25-year-old medication technician from Modesto, CA, who sang "A Song For You" by Donny Hathaway for his performance. Katy said Ryan had listened to their critiques and feedback and applied it all to his showcase performance, which the judges really appreciated. Katy could tell Ryan was finding out who he is and it was working for him. Ryan therefore made the Top 20. Kate Barnette, a 23-year-old nanny from Kennesaw, GA, sang "Royals" by Lorde, and Evelyn Cormier, a 19-year-old teacher from Claremont, NH, performed "No Roots" by Alice Merton. Both talented ladies made the Top 20, as their showcase performances alleviated any doubts the judges had about them. Emma Kleinberg, a 21-year-old college student from Bel Air, MD, sang "Is This Love" by Bob Marley & The Wailers. Katy said the judges loved her sound and the grit in her voice. Katy also acknowledged, however, that Emma's voice demands attention from the audience but her performance didn't exactly do that the previous night. Katy asked Emma to find "more sparkle," and with that being said, the contestant was ousted from the competition. Uche, a 24-year-old wedding singer from Sugar Land, TX, belted out "Play That Funky Music" by Wild Cherry and made the Top 20 after much debate and discussion from the judges. Alejandro Aranda, a 24-year-old dishwasher from Pomona, CA, sang "Yellow" by Coldplay. The judges loved his vibe but Katy pointed out it's "not stereotypical stardom." Katy advised Alejandro to keep taking risks before sharing the news he is "brilliant" and had advanced to the next round. Jeremiah Lloyd Harmon, a 26-year-old music teacher from Catonsville, MD, impressed the judges with "Landslide" by Fleetwood Mac. The judges thought it was bold he didn't sing with an instrument but his voice sounded really sincere and honest. Katy told Jeremiah she loved and accepted him and was so proud of him. Jeremiah was told his journey was going to continue on American Idol. Shayy, a 17-year-old high school student from Midlothian, VA, sang "All I Ask" by Adele but the judging panel did not "feel" her performance. Lionel told Shayy she is inspiring, but since this is a singing competition, she's not quite up to par. Lionel said the timing was wrong for Shayy and so it was time for her to go home. It was also the end of the Idol road for Mica Giaconi, a 16-year-old high school student from San Diego, CA; Dayton Taylor, a 22-year-old airport singer from Nashville, TN; and Idalis, a 22-year-old timeshare representative from St. Cloud, FL. But Riley Thompson, a 16-year-old high school student from Mabank, TX, made it through to the Top 20 after her performance of "Mama's Broken Heart" by Miranda Lambert for the showcase round. Raquel Trinidad, a 21-year-old server from Tampa, FL, also delivered an outstanding performance of "Rich Girl" by Hall & Oats, followed by Shawn Robinson, a 22-year-old hardware store associate from Atlanta, GA, with "Rock With You" by Michael Jackson. And then Bumbly, a 27-year-old subway singer from New York, NY, belted out "Baby" by Clean Bandit featuring Marina & Luis Fonsi in Spanish. All three hopefuls made it to the next round of competition. Wade Cota, a 27-year-old musician from Phoenix, AZ, then took the stage with "Work Song" by Hozier. He wasn't entirely convinced he had what it takes to excel in American Idol, but the judges could feel his emotion and heart. Luke then told Wade he had made the Top 20. Margie Mays, a 25-year-old dog walker from Wilmington, DE, and Eddie Island, a 25-year-old rideshare driver from Nashville, TN, were asked to approach the judges together. Margie had performed "All About That Bass" by Meghan Trainor, while Eddie had taken the stage with "Don't You Worry Child" by Swedish House Mafia featuring John Martin for the showcase round. Katy said the show is not called "American Personality" or "American Singers." The judges were testing the hopefuls' ability to connect with the audience during the showcase round. Margie failed to rise to the occasion, but Eddie made the Top 20. And finally, Tyler Mitchell, a 26-year-old oil field mechanic from Florien, LA, and Laine Hardy, an 18-year-old musician from Livingston, LA, were asked to meet with the judges together. Tyler sang "Suitcase" by Steve Moakler, while Laine performed "Come Together" by The Beatles in a suit with his hair slicked back. "Am I allowed to have a crush on a contestant?" Katy asked Luke and Lionel. "We have made a monster." Laine was nervous because this was the stage of competition in which he had been cut last year. Luke explained Tyler had some ups and downs in the competition this season, while Laine had a pretty similar journey on the show. There was only one spot remaining, and the good news went to Laine. On Monday night, American Idol's Top 20 will take the stage with wall-to-wall performances on ABC.